Since 1922, Grant has offered a wide selection of products that exemplify innovation, value, and style. 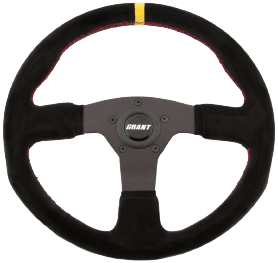 Whether you are looking for a steering wheel for your classic car, race car, UTV, golf cart, or old fixer upper, Grant has the steering wheel and installation kit for you. Grant has been developing steering wheels for the off-road and racing industry for decades, using its 'Full Hoop Design' for superior strength and performance. This, along with many different size and material specifications, gives Grant customers the best options for these vehicles. Grant produces suede steering wheels for all drivers. The Suede Series offers each driver a premium suede wrapped wheel, hand stitched custom colored thread, racing center stripe, and a contoured grip for the ultimate comfort and styling. Grant’s 'Full Hoop Design', along with other key design features, makes it the most reliable steering wheel on the market.